Six Riksdagsparties (plus Feministikt Initiativ but without Centerpartiet and Sverigedemokraterna) agreed to participate in the anonymous web-survey that was distributed by the parties themselves via their email list in May/June 2015. A total of 10,392 members across the seven parties completed the questionnaire. See here for more information on the methodology of the survey, the full questionnaire and a complete report. Members are often assumed to be one of the most loyal voters (Scarrow, 2014). Yet, respondents to our survey indicate that this assumption may need to be qualified. 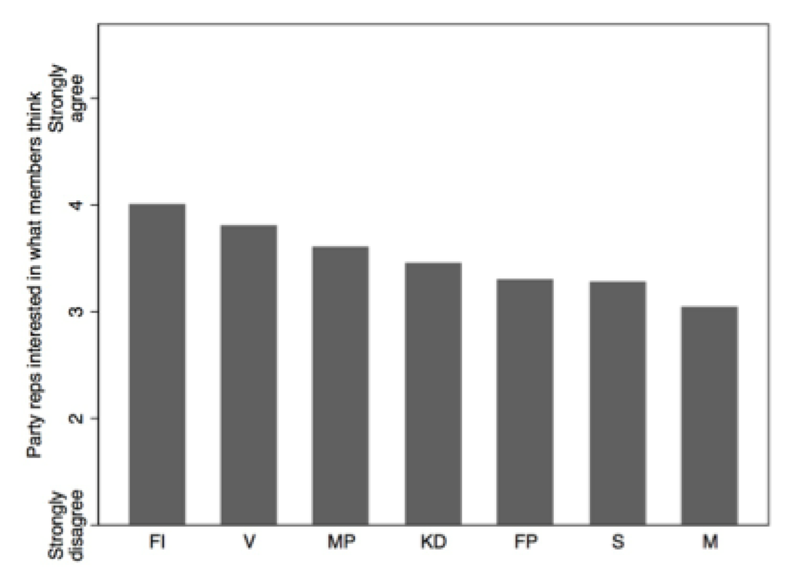 Figure 1 shows that Socialdemokraterna’s members appear to be the most loyal voters when asked about their voting behaviour in the 2014 Riksdag election. Only 4% defected to a different party, whereas more than 10% of Miljöpartiet’s members voted for a different party in 2014. For the other parties, the percentages range in-between. This highlights two things: first, the assumption of loyal party members is not wholeheartedly true, and second, the number of defecting members in the last election could have made a difference for the electoral result. Figure 1. Percentage of respondents that reported casting a vote for another party in the 2014 parliamentary election by party. Members might have voted strategically to support or weaken a certain party (or group of parties) in the election. This also finds support in the level of importance members of different parties place on the governing role. According to our survey and displayed in Figure 2, members of the largest parties value the role of office highest, followed by the smaller parties of the Alliance and the smaller left-of-centre parties. It shows that not all members think governing is the most important goal. Figure 2. Average responses per party on the importance of gaining governmental office. Members of the two largest parties place more emphasis on the goal of governing. But those members are also the least likely to agree with the statement ‘Most party representatives are genuinely interested in what members think’ [De flesta partirepresentanter är genuint intresserade av vad medlemmarna tycker]. 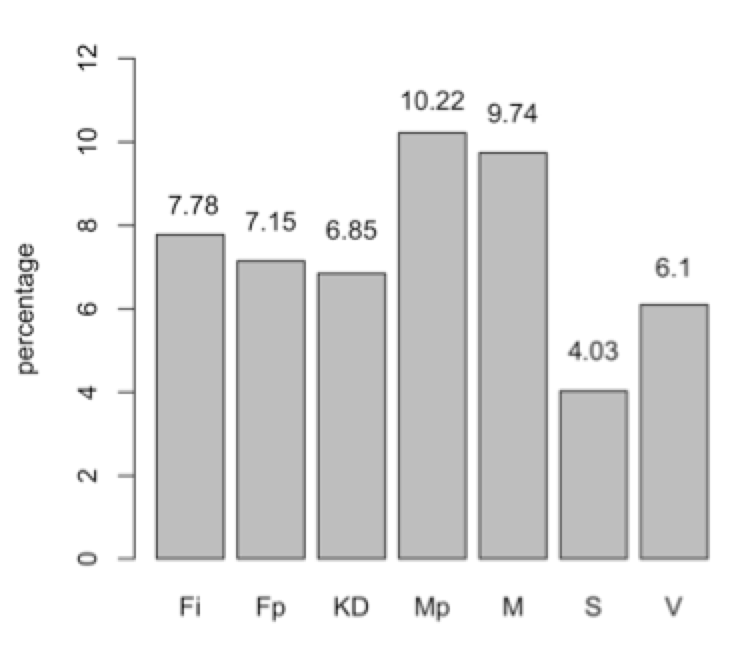 As Figure 3 demonstrates, perceived efficacy within the party is highest within Fi and lowest for S and M. It indicates that the larger parties have a more difficult time connecting the party elite to their members, compared to the smaller, and in particular left-of-centre parties. Figure 3. 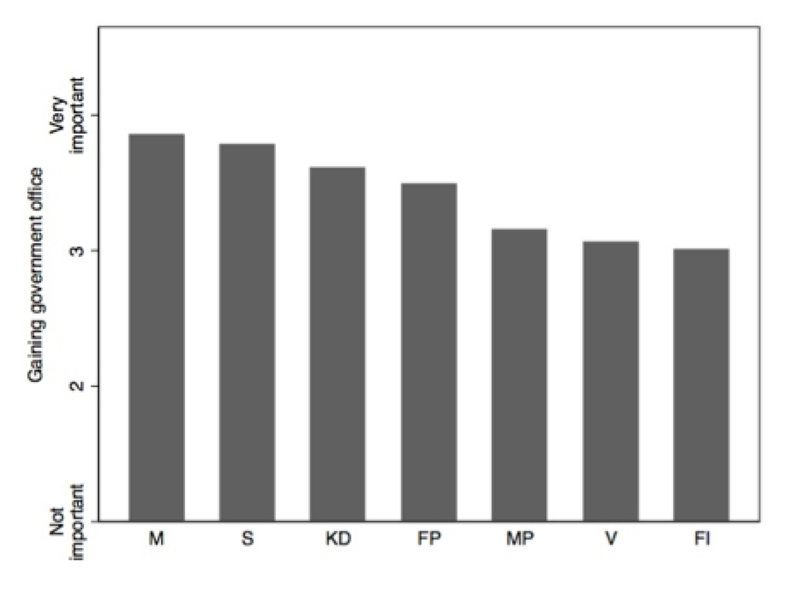 Average responses per party on members’ efficacy within the party. Research has highlighted the tension between office-, vote-, and policy-seeking goals for political parties (Müller and Strøm 1999), and we find similar differentiation in the prioritization of these sometimes competing goals by party members as well. Smaller, more ideologically extreme, or single issue parties are less likely to emphasize gaining government office compared to larger, more established parties. Yet the members of these smaller parties appear to believe that they have more voice within their organizations than the members of the major mainstream parties. The three findings of this post speak to the exit, voice, and loyalty (Hirschmann 1970) choices of party members today. The information provided here is preliminary, descriptive, and of course requires more analysis, but hopefully also illustrates some of the types of questions we can address with this new survey of party members in Sweden. Scarrow, S. E. (2014). Beyond Party Members: Changing Approaches to Partisan Mobilization. Oxford: Oxford University Press. Müller, W. C., and K. Strøm. (1999). Policy, office, or votes? : how political parties in Western Europe make hard decisions. Cambridge University Press. Widfeldt, A. (1995). Party Membership and Party Representativeness. In H.-D. Klingemann & D. Fuchs (Eds. ), Citizens and the State (Vol. 1, pp. 134–182). Oxford: Oxford University Press. Widfeldt, A. (1997). Linking Parties with People? Party Membership in Sweden 1960-1997. Ph.D. Theses. Göteborg: Göteborg University. Det här inlägget postades i Partier, Partikultur och har märkts med etiketterna partier. Bokmärk permalänken.